A secondary antibody selection guide to help you determine the best one for your application. Host: The host is the species that the antibody was created in. Secondary antibodies are raised against a host species to create a specific primary antibody and when choosing a secondary antibody for an application, it needs to be different from the target species: if a primary antibody was derived in a mouse, the secondary antibody needs to be anti-mouse, or an antibody that was not raised in a mouse. Detection Assay: Another important factor in choosing an optimal secondary antibody is knowledge of the detection assay. If the target immunoassays are WB, Immunoprecipitation (IP) or ELISA, the ideal secondary antibody would be enzyme conjugated. If the target immunoassays were IF or Flow Cytometry (FC), the ideal secondary antibody would be a fluorochrome conjugated antibody. For detection of proteins that are expressed at a low level, the ideal secondary antibody would be biotinylated. Purification: The purification of an antibody involves passing it through a column that has resin with an immobilized ligand. The ligand and the antibody will bind to one another, the serum is washed and a buffer is added to decouple the ligand-antibody interaction, which yields a purified antibody. This type of purification can be done either with a target antigen (the antibody recognizes a ligand), or an affinity ligand (a ligand that recognizes a specific antibody). The target antigen will be beneficial for seeking purification of antigen specific secondary antibodies only, whereas for a more generally applicable purified secondary antibody, the most beneficial would be the affinity ligand. Affinity purified antibodies will increase specificity, decrease background, and increase sensitivity. A purified antibody will reduce variation which will yield more reproducible assays. Cross-adsorption: Cross-adsorption involves the passing of an affinity purified secondary antibody through a column that contains immobilized antibodies from another species. The secondary antibodies will recognize these foreign antibodies and bind, and the rest will be flushed from the column. This process helps eliminate cross-reactivity from non-target antibodies, which in-turn increases the specificity of the secondary antibody. Fragmented secondary antibodies are divided into two types of fragments: F(ab) and F(ab’)2. Whole or Fragmented: Secondary antibodies can be either whole or fragmented, and the decision to choose between the two is dependent on the application. Whole secondary antibodies are more commonly used, and contain both H & L chains. They are widely regarded for the strong divalent binding to variable regions and are equipped with sufficient regions for the attachment of enzymes and dyes; however they can result in high background, an increased amount of cross-reactivity and a lower specificity. Fragmented secondary antibodies are divided into two types of fragments: F(ab) and F(ab’)2, both of which are small and eliminate non-specific binding to FC receptors, which is ideal in FC, IHC and IF applications. F(ab) fragments are small monovalent antibody fragments (MW=~50kDa) that are the result of a whole antibody digestion by the enzyme papain. This fragment contains a single binding domain and a small constant region. They are useful in blocking background caused by primary antibodies, as well as endogenous immunoglobulins on cells and tissues in labeling experiments. F(ab’)2 are divalent fragments that are a result of a whole antibody digestion by the enzyme pepsin. They contain a strong divalent bonding in the variable regions, and may penetrate tissues more easily because of their size (MW=~110 kDa). Conversely, the small sizes of these fragments allow a less conjugation of dyes and enzyme, which results in a decreased sensitivity. Multiplexing: Secondary antibodies can be more advantageous if they are conjugated with multiple fluorescent dyes, which allows for a simultaneous identification of different target regions. Highly cross-adsorbed secondary antibodies work optimally because it decreases species cross-reactivity and background. Class/subclass: Antibodies are divided into different isotypes: IgG, IgM, IgA, IgD, and IgE. EpiGentek offers IgG antibodies, which are broken down into IgG1, IgG2a, and IgG2b (the difference between G1 & G2 is the composition of amino acids). When choosing a secondary antibody, it would need to target a specific class/subclass of primary antibodies. If the primary antibody is IgG, then the secondary antibody should be anti-IgG that recognizes both H & L chains of the primary antibody. Monoclonal IgG antibodies are subclass specific, so the secondary antibody must be specifically directed against that same subclass. 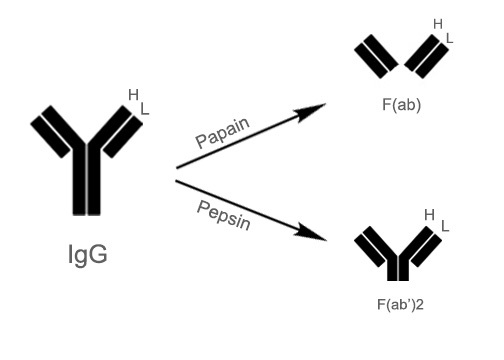 If the class/subclass of the primary antibody is unknown, use an anti-IgG F(ab).